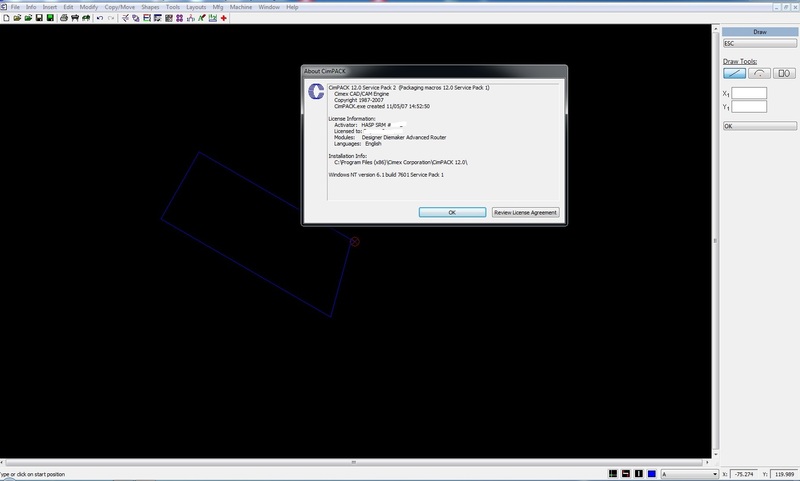 CimPACK is a Windows program that allows the user to create a full set of tooling for the Diemaking, Folding Carton, and Corrugated Industries. Steel Rule Dies, Phenolic and Steel Counters, Stripping and Blanking tools, Rotary Dieboards and Ejection Rubber are all very easy to create using CimPACK. Consists of a large library of Standard Designs, and Mix and Match so that you can create a one-up design and then lay it out to a printed sheet. Parametric design capability is also included. The standard Diemakers software includes tools for adding punches, hang holes, and die-edges. It also contains the tools for adding stripping/breaker knives, balancing rules, and chase registration holes. The advanced Diemakers software includes the standard items plus all of the pre-press tooling. This includes the SF/SC Component Stripping System, the EASIBLANK(TM) blanking system, the SPEEDBAR(TM) presser bar system, the BSI Flush presser system, and the Bobst SPider presser system.. It includes all of the Designer, Diemaker, and Advanced Diemaker functions. The Rotary functions can be added to CimPACK Complete and both of the CimPACK for Diemakers products. In the list below you may find software products which use WIBU CodeMeter dongles. ABB products: WCAD, Composer, etc. SD Checker 01 by Japan Bio Farm Co. Ltd. Mighty Map by Techtom Ltd.
Eonfusion 2.0 by Myriax Pty. Ltd.
ACT Matrix Version 1.05 © PRAIS S.r.l. Aligner 2006 v7.03 © Space S.r.l. ArchiPlan, Analist, Urban 3D, 3D Room © Analist Group s.r.l. Bigas SGis-N 4.6.7 © A.E.B. s.r.l. CalCad 2D-GR, Caligola CalCad RP-GR 3.95, CalCad ST © COMELZ s.p.a.
CANT, 10.0, 11.0, 2002, CANT LINE 9.0.376 © Prometeo S.p.A.
DeFTest © TXT Polymedia S.p.A.
Domus 3D 5.5, 6.0 © Maticad s.r.l. EasyGLASS 4.8, EasyCUT, EasySTONE, PowerARM, EasyWOOD © DDX s.r.l. Elux3D © Render Image S.r.l. Ericsoft Miami, Hotel, Risto, Studio 2.5 / 3.0 © Ericsoft S.r.l. FORGE3 2006, REM3D, THERCAST © Transvalor S.A.
Frontline Documents System © Regula Ltd.
GEOS 8, GEOS 7, GEOS 6.4 © ZEIA d.o.o. Gestion d'Entreprise © WinGEIM Ltd.
LAM32, PRDATA, POST-PROCESSOR, SVILUPPI, WINTERM, WINDNC, PRAUTCAM © InterSystems S.R.L. Maximum, Virtual Radio © AEV S.p.a.
Naxos 2014, Meti Standart © Teseo s.p.a.
Nominas Monitor Informatica © Monitor Informatica Software, S.L. O-Key Win © Valves s.r.l. Ottimo-Perfect Cut 7.5.3, Cutty 5.21, EasyCut 3.05 © Spai s.r.l. PC Rental Pro © VisualAid Software Ltd.
PowerStairs 4.8 © DDX s.r.l. ProTools HD Pack © DigiPark Sp.z o.o. repSL Engine, repSL Developer © Software E Sistemi Avanzati s.p.a.
travilog, termolog, compulog © Logical Soft s.r.l. WinFAT 2004 © Winfat S.r.l. WinJay 3.0 © Winjay S.r.l. Zevs 2000 © PIA d.o.o. UniCAD 6.0, 7.0, 2003 Pro, 2004, 2005 © UniOPEN Software Ltda. ASAD 2.4.925 © Hiteshew Engineering Systems, Inc.
Dinesat 8 © Hardata S.A.
HDX Radio © Hardata S.A.
neoMAX-Pile, PM3, neoMAX-2D 1.1, NeoMAX-3D 2.0 Professional, neoPLAN 5.0, neoPLAN-FED 5.0 © Han Park Soft Co.
i2 Investigative Analysis Software, Analyst's Notebook © i2 Inc.
VidCAD © CommSYS Design, LLC. Excel Building Supervisor (XI584) © Honeywell Inc.
IPSMAQ for Windows 5.9 © IPS S.L. ReCalc 5.0 © T-Cubed Systems, Inc.
Prodas V3 3.3 © Arrow Tech Associates, Inc.
KeyTERRA © Key Traffic Systems Ltd.
PCX1000 7.1 Professional © EquiTron, S.A.
Cutty 5.21 © Spai s.r.l. QuickStrokes CAR Version 1 © MITEK Systems, Inc.
QuickStrokes FORM Version 1 © MITEK Systems, Inc.
QuickStrokes ARAB Version 1 © MITEK Systems, Inc.
QuickStrokes Version 1 © MITEK Systems, Inc.
QuickStrokes 2.80 Version 2 © MITEK Systems, Inc.
SMSEnlace v.1.2.7 © MGA Metodos de Gestion Avanzada, S.L. DREDGEPACK, HYSWEEP Survey, HYPACK MAX 4.3A © Coastal Oceanographics Inc.
Hypack © Coastal Oceanographics Inc.
Hypack 6.2 © Coastal Oceanographics Inc.
Ramsete v1.5 © Spectra s.r.l. Contour Standart © Contour Components Ltd.
Avid Liquid Palladium/Vortex © Avid Technology, Inc.
Truck Scale Software 3.0 © Fast-Weigh, Inc.
AGFA Pixtasy 5.0 © Agfa Corp.
Warrior Well Logging System 7.0 © Scientific Data Systems, Inc.
12d Model version 12 © 12D Solutions Pty Ltd.
ProLan Ftest 3.20 © Prolan Inc. Kitchen Master 7.40R © Goods, S.L. GBIS v7.1 © Micromine Pty Ltd.
Micromine 2007 © Micromine Pty Ltd.
Stitch 2000 Pro © Data-Stitch Inc.
Micromine v10.0.4 © Micromine Pty Ltd.
Nanoteck 2008 Professional Embroidery Software © Sumac Co. Ltd.
Winter Holter Analyzer 3.1, Physio-28 © Galix Biomedical Instrumentation Inc.
Physio-28 © Galix Biomedical Instrumentation Inc.
EGG-PS, ERGO-PS © Galix Biomedical Instrumentation Inc.
WinPCSIGN Pro 2006 © Entreprises Sign MAX, Inc.
Pyme Pro 2.1 © Red Latina S.L. Sonnet 10.53 © Sonnet Software, Inc.
Robotus v.1.3.6 © Cameleon Inc. Structural Material Manager 9.1 © E.J.E. Industries, Inc.
CypeCAD 2005.1 © CYPE Ingenieros, S.A.
Hidrofive © CYPE Ingenieros, S.A.
GEMS 6.0 © Gemcom Software International Inc.
XPOLYPLUS V900 © XPLAB s.a.s. XCAP 3.0 © EPIX, Inc.
PIXCI CL3D 2.2 © EPIX, Inc.
m.objects v3.4 © Prasentationstechnik e.K. RSoft CAD 5.0, LaserMOD, OptSim, BeamPROP, FullWAVE, BandSOLVE, GratingMOD, DifractMOD, MOST, FEmSIM © RSoft Design Group, Inc.
JewelCad 5.1 Light © Jewellery CAD/CAM Ltd.
JewelCad 5.1 Light Educational © Jewellery CAD/CAM Ltd.
WinMark Pro 6.0, 4.6, 2.1 © Synrad, Inc.
JewelCad 5.1 Designer © Jewellery CAD/CAM Ltd.
JewelCad 5.1 Educational © Jewellery CAD/CAM Ltd.
Lonati DIGRAPH 3 Plus PULSAR © Dinema S.p.a.
JewelCad 5.1 Demo © Jewellery CAD/CAM Ltd. Ink Formulation 4.0 Network version © Color Control Systems, Inc. Eye One System © Color Control Systems, Inc.
SpetroMat for Pressroom Control, Eye One System © Color Control Systems, Inc. Ink Formulation 4.0 Local version © Color Control Systems, Inc.
Rutatrol 1.6, Rutatrol 2.1 © TESMA s.a.i.c. MiDAS 2 © Xcitex Inc.
ProAnalyst v.1.1.9.0 © Xcitex Inc.
ProAnalyst v.1.5.0.2 © Xcitex Inc.
ADR, AdvancedDNC, Factory Network Software © Advanced Digital Research, Inc.
ER Mapper 6.2 © Earth Resource Mapping, Inc.
Euro2000 TPV © CentroMiPC S.L. NEPLAN 5.2.0 Power System Analysis and Engineering © Busarello + Cott + Partner Inc.
Tricot Paint © Trisoft s.r.l. Tricot Line © Trisoft s.r.l. Micro-Muni Debt © Financial Management Systems, Inc.
ME'scope Visual Engineering Series 4.0 © Vibrant Technology, Inc. TANGO Gestion IV, TANGO Evolucion II 8.7 © Axoft Argentina S.A.
CoreImposition 3.0 Japanese © UNIDOCS Inc.
CoreImposition 3.0 Japanese / Eng © UNIDOCS Inc.
CoreImposition 2.0 / 3.0 © UNIDOCS Inc.
CoreImposition 3.0 © UNIDOCS Inc.
CoreSeparation 3.0 © UNIDOCS Inc.
CoreImposition 2.0 © UNIDOCS Inc. AIMS Instrumentation IO Servers © AIMS Instrumentation & AIMS Wonderware PTY LTD. Phase 6.0, Slide 5.0, Examine, Unwedge, Swedge, RockFall, CPillar, Dips 5.0 © Rocscience Inc.
MapEdit Pro 5.0 © Resident Ltd.
ESPRIT 2010 CAM-System, Auton CAM Processor 7.1 © DP Technology Corp.
Cafe Central, Cafe Terminal © COMALEX Inc.
ELST 7.00, PiaPG, PIA2002 v.3 © I&S SUD INFORMATICA e SERVIZI s.r.l. neoPLAN 5.0, neoPLAN-FED 5.0 © Han Park Soft Co.
SnapCAD Exchanger (Mechanical Design Software), STX 3.6.87 - Shell and Tube Heat Exchanger Thermal Design Software © Heat Transfer Consultants, Inc.
ITL 2.0 - Tube Field Layout, ACX 3.6.312 - Air Cooled Heat Exchanger © Heat Transfer Consultants, Inc.
ToxChem1 2.0R7.1 © Hydromantis, Inc.
MS2600 3.20 © Micrographic Sciences, Inc.
EuroCut Professional 6, Pjannto RIP 2, EuroFACT 5, EuroVECTOR 2 © EuroSYSTEMS S.a.r.l. CoCut Pro 12, Pjannto RIP 2, EuroFACT 5, EuroVECTOR 2 © EuroSYSTEMS S.a.r.l. Embroidery Designer III / EMB~Designer v.7 2004.01.16 © Corbett Systems, Inc.
Ciberprint 5.0 RIP Software, CiberCut 5.6 MAX, PRO © CIBERCAT, S.L. BioWin Wastewater Modelling © EnviroSim Associates Ltd. Brother Embroidery Software BES-100E 2.14 © Brother Industries, Ltd.
DataCAD v.9 © DATACAD LLC. DataCAD v.11 © DATACAD LLC. DataCAD v.8 © DATACAD LLC. DataCAD v.10 © DATACAD LLC. Contact Management Version 12.x, Soule Software 12.110.09 © Soule Software Corp.
KeyTERRA, KeyTRAFFIC, KeyLINES, AutoSIGN © Key Traffic Systems Ltd.
KTS © Key Traffic Systems Ltd.
Opty-Way go-CAD 6.2.6.15 © Optima s.r.l. CadEM 4.6 © Stabile Engenharia Ltda. mCalcLIG 2.2, mCalc3D 1.87, mCalc, mCalcMix, ST_Cnc © Stabile Engenharia Ltda. Supergraphics for Windows 4.48 © SANGIACOMO S.p.A.
Trazado © Ingenieria del Trazado S.L. GATF Hexagon © ColorMetrix Technologies, LLC. AlienBrain 7.1 © Avid Technology, Inc. AIMS Instrumentation I/O Servers © AIMS Instrumentation & AIMS Wonderware PTY LTD.
WinDIS 1.21, PowerCAD 4.10 © Fractal d.o.o. Matec Editor Grafico MATCAD (Donna) © Matec s.r.l. Matec Work Bench © Matec s.r.l. Matec Editor Grafico MATCAD (Mono) © Matec s.r.l. TouchProbe Guard Tour System 6.0 © Time Equipment Corp. CALL Master 3.1 © SpeechSoft, Inc.
HYPACK Survey © HYPACK, Inc.
ASIS (Ayuda de AsisW) 1.16, 2.18, 2.25 © CRONOS S.A.I.C. Chekin II v.7.31 © CRONOS S.A.I.C. F22WIN 3.22.005 © CRONOS S.A.I.C. NEPLAN 5.3.2 Power System Analysis and Engineering © Busarello + Cott + Partner Inc.
Viz Graphic Hub Terminal © Vizrt Ltd.
Viz Artist / Trio / Engine 3.2 Virtual Studio © Vizrt Ltd.
ACCORDO SISTEMA ELETTRONICO PER PARTI DI RICAMBIO (EIS) © AUTOGERMA S.p.A.
Advanced Cartographic Environment 3.0 (ACE) © PCI Carto Inc.
AIRMAP, CHEMMAP, CMS, OILMAP, MUDMAP, SARMAP, SIMAP, COASTMAP, HYDROMAP, SSDOSE, SSFATE, WAVEMAP, WQMAP 5.0 © Applied Science Associates, Inc.
AR-Editor 2.5 © AR-Vision co,. Ltd.
BioComp Profit © BioComp Systems, Inc.
ClearSCADA 2007 R0.1 © Control Microsystems Inc.
ColorBurst RIP © CSE, Inc.
CASA © TEMEC Instruments B.V.
Corredor © Piramidal Software S.L. CurveTrader, HW-Trader © Leap of Faith Research Inc.
DIAdem 8.1, 10.0 © National Instruments Corporation. DirectSOFT32 4.0 © HOST Engineering, Inc.
EDISIS, POR, TRUSS, HYDRONET © Newsoft s.a.s. EMME/3 3.1 © INRO Consultants Inc.
Fax Imaging application © MetaSoft Co. Ltd.
Fingerprint Identifikation Module, BioCheck SDK © Biometrix Int. Gallup Galileo, Gallup Media © Ulter Systems Ltd. Global Estimating, BETS, BTOS, BOLTS, Scale-Link © Building Software Services Ltd.
ICPR (Interconnected Channel and Pond Routing) Model © Streamline Technologies, Inc.
JobPack Systems 9.4 © JobPack, Inc.
LAStudio 6.0 © Pangolin Laser Systems Inc.
MINITAB v14.2 © Minitab Inc.
Network MediaPlayer © RP professional sound products L.P.
OpaWin 2.1 © GammaCom S.R.L. PBX Tarificator © DCS Laboratory, Ltd.
PowerDAQ for DIAdem © United Electronic Industries, Inc.
PreisMax 2.2, ManageMax, VisiMap, MailingMax © MaxPro Software. PRO-BELT v4.2, PIPE-PRO v3.1 © Professional Designers & Engineers, Inc.
PTW (Power System Analysis Software) © CEE Relays Ltd.
RapidForm 2006, RapidForm XO - 3D Scanning Software © INUS Technology, Inc.
RSLogix Guard PLUS! © Rockwell Automation, Inc.
Runet APD IKA © RUNET software & expert systems. S4 Metering Products, ProPak, DG1100 © Landis+Gyr Inc.
Sistema SPC (SEGOB) © MGT Consultoria S.A de C.V. Sport Software © Computer School. TALLY 7.2 © Tally Solutions Pvt. Ltd. The Flex Suite Pro (Flex Live, Gas Flex, Air Flex, Steam Flex) © Flexware, Inc.
Theoretics © Theoretics Holdings, Inc.
Thinkdesign 2010.1 © think3, Inc.
UNCLE PROFESSIONAL, UNCLE REPORTS © The Uncle Group, Inc.
URANUS Windows © URANUS Software GmbH. Web-Audios © AudioLogic Software Inc.
WinLase Professional © Alase Technologies, Inc.